Well, it’s official. Mel and I are heading to Pennsylvania for the summer. In the middle of winter, we were sitting around our apartment one night and Melissa turns to me and says, “I want to work at a camp this summer.” I’ve always loved camps. I went to camp just about every summer from the time I was 6 until I was 16 or so. Then I worked at camps. So I was more than happy to help look for one. Additionally, Melissa has to do an internship for her master’s degree. This seemed like a good way to kill a couple birds with one stone. She gets her credit, we get paid a little bit, we get to have a fun summer, and we get to save money. 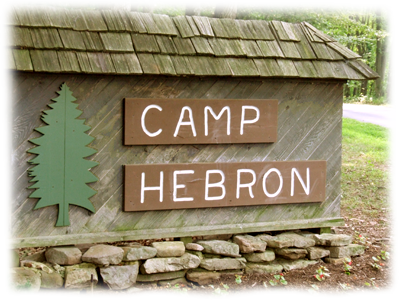 We talked to a lot of camps, but in the end we settled on Camp Hebron in Halifax, Pennsylvania. Melissa has accepted a position as a camp pastor for the summer, and I’ll be working as a first aid consultant (basically, a camp nurse). ORMS Weekend Was a (Cold) Success! For those of you that don’t know, ORMS stands for Old Rag Mountain Stewards. Basically, ORMS is a ski patrol (of sorts) that patrols Old Rag in search of hikers in distress. And, with thousands of hikers per year, there are a good number of them to be found on Old Rag. Melissa and I decided it would be fun to join these fine folks. 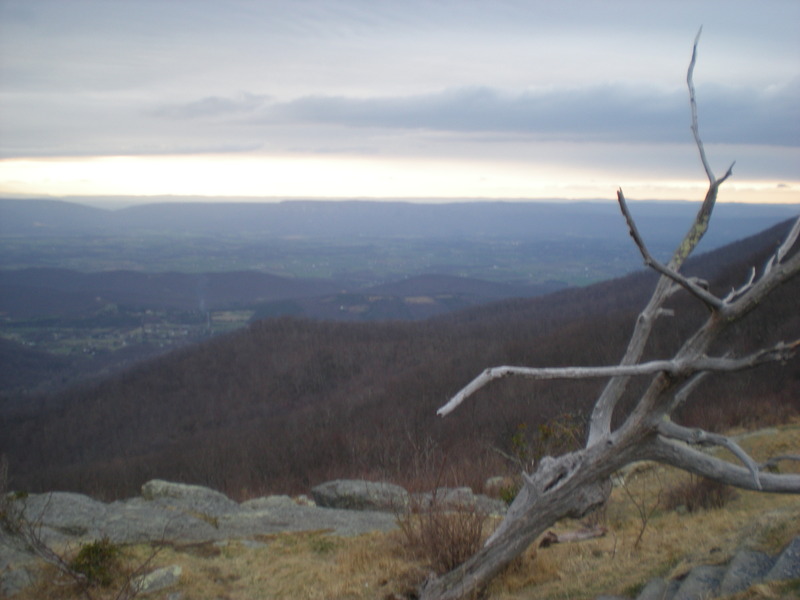 The first step was going to a weekend long course in Shenandoah National Park, which happened this past weekend. The primary focus of the weekend was to get everyone certified in Wilderness First Aid. We arrived Friday evening; within about 20 minutes of our arrival at the Big Meadows Campground, snow flurries were dropping. We decided it would be best to get our camp set up, and quickly! With the tent set up, sleeping bags unrolled, and gear laid out, we went in search of food. 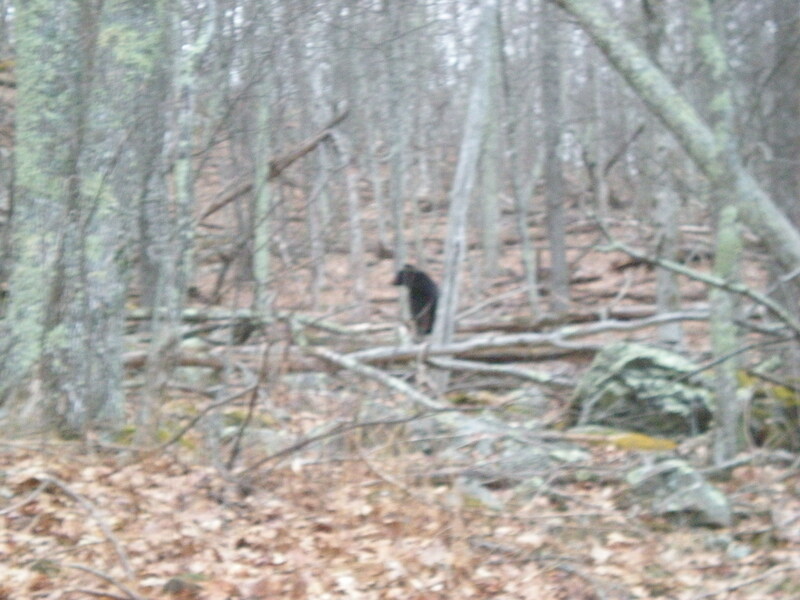 While driving around, we saw a bear as well as some beautiful views. Unfortunately, the various restaurants in SNP were closed; we did, however, find a restaurant with fairly nice food in Luray. Service left a bit to be desired, but we’ll probably go back. …at 6:30 AM… Neither of us wanted to turn out of the sleeping bags; we got dressed very quickly because of the cold. Luckily there was hot coffee, bagels, and fruit waiting for us at the Big Meadows Fire Cache! Our WFA instructor was named Marco Yuracheck, who has the distinction of falling 35-40 feet from the top of Big Schloss and surviving. He was a great instructor! We’d highly recommend him to anyone wanting to learn how to deal with medical emergencies in the outdoors. Dinner that night was awesome too; my pay grade dosen’t get steak that often, but that night we had the best steaks I’ve ever had. The second day also found us wrapping up the WFA class with a pretty intense final scenario. We were alerted that three climbers had suffered an accident. We were able to evac them relatively quickly to the trailhead. All in all a fantastic weekend. We had a great time meeting everyone, and made a lot of new friends. We can’t wait to start spending time up on Old Rag! I have a love-hate relationship with spring. On the one hand, I love it that it’s becoming warmer. I love that the trees are getting little green and red buds. I love the longer days. On the other hand, I hate the climatic variablity. In other words, I don’t like it that it will go from 68 degrees, sunny with a light breeze to 35 degrees, cold rain and mist. The most annoying thing about this whole situation is that I have tomorrow off! I was hoping to do something fun and outdoorsy, but it looks like I may have to put that off. It’s currently raining, cold, and windy, with VERY DARK black clouds zipping across the sky. Added to this is that this weekend they are calling for snow and low 30 degree temps…right during the time Mel and I will be camping in Shenandoah National Park doing Old Rag Mountain Stewards training. We recently were able to try out a few new tools and techniques in the climbing realm. We had planned on heading out to Lower Hidden Rocks and climbing for the afternoon. Due to a career fair taking longer than expected, Melissa and I met Josh and Jackie at the rocks a bit too late to do much in the way of real climbing. Luckily, the days are getting longer, we had all packed our headlamps, and we knew the trail pretty well. The first exciting bit was that Melissa, Jackie, and Josh all got to try out new pieces of equipment. Jackie was sporting her new pair of climbing shoes, and used them to great effect on Bucketland, rated a solid 5.4. It was also the first time Jackie had used her new harness, a Black Diamond Primrose, on an outdoor climb. Jackie reports that the harness is very comfortable. We all were able to test out Josh’s new toy, a brand new 60 m climbing rope. We had more than enough rope to rig both Bucketland and Warm Up Crack on one rope using a giant “M” configuration. 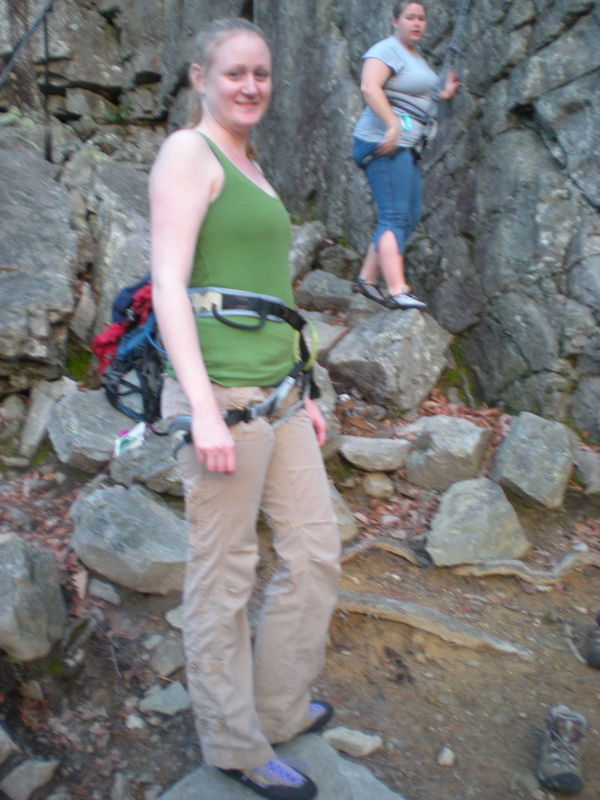 Melissa was also excited to try out her brand new harness, a very pretty Petzl Luna. We got it on sale in Charlottesville; they were selling several types of harnesses at Blue Ridge Mountain Sports for 40% off. The Luna usually goes for about $70. You do the math, we got it for a steal. She was able to send Bucketland with no problems. 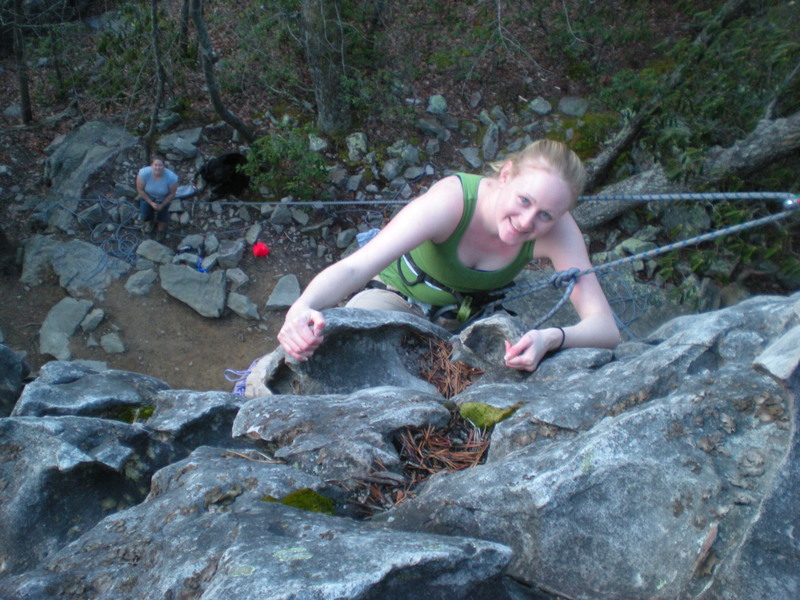 In fact, because I happened to be up on top of the rock getting ready to rig a rappel, we were even able to get a great picture her at the summit! 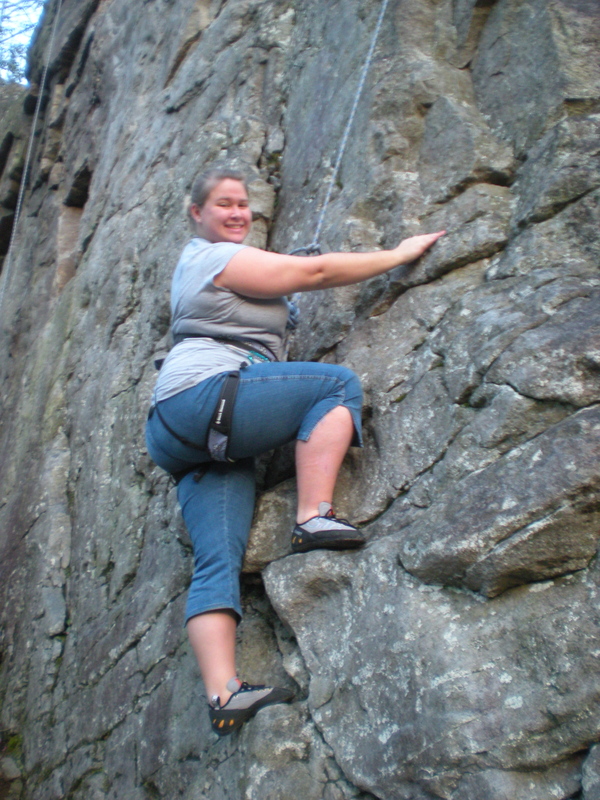 Melissa reports that the Luna is very comfortable, and is actually more comfortable while climbing than it was when she was testing it out at the store. Hmmmm…I wonder if I could get her to do a guest post in the “Gear I Swear By” section? I love this shot...Love the rock Melissa! 2. It is better to use short runners. Josh and I ended up hanging way below our belay device. 3. Two guys tandem rappelling looks…ahem…questionable. At least, our wives said so! But I’ll let you judge based on the picture. This isn't what it looks like, I swear! (Incidentally, I think that’s one of the first pictures of me to appear in a blog post…). We hiked out by headlamp. A very satisfying day. Well, with the onset of late winter, outdoor adventure opportunities have started to become more possible. 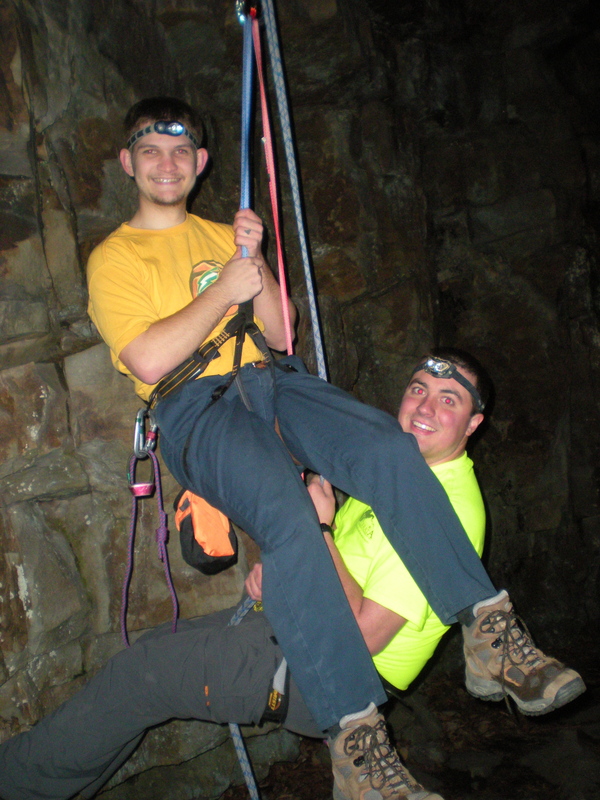 We managed to get a caving trip in this past Sunday. Dawn negotiates a tight crawl. 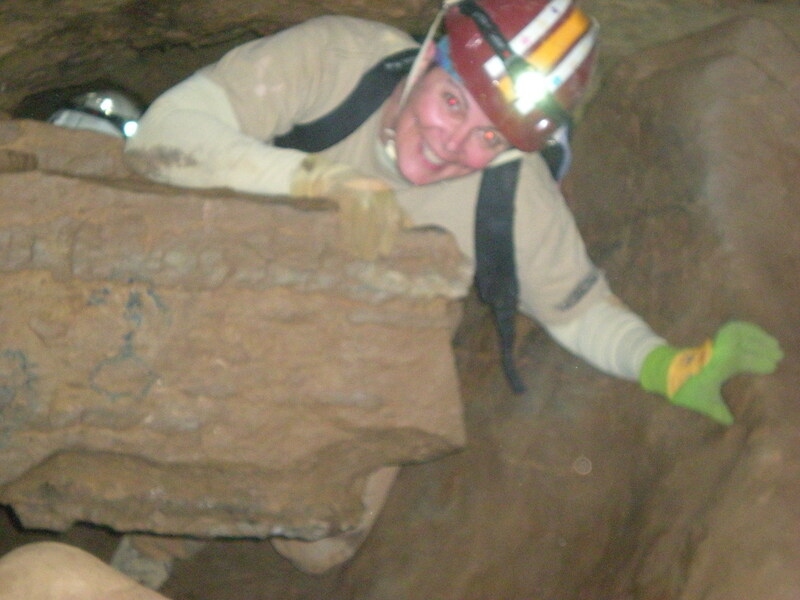 I discovered a couple months ago that Dawn, a good friend from work, is also an avid caver. She invited Melissa and I on a caving trip; in return, I promised I’d take her into some of the caves in the area that I know about. We were origionally going to visit Glade Cave; with the massive amounts of rain we’ve been having, I decided to divert to Keyes Cave, not too far from Franklin, West Virginia. Despite some mild setbacks (broken down cars, slightly later start, and very slow motorists on rt. 33) we made it to the cave in one piece. We finished the day with a great semi-technical tunnel, which required us to chimney down a passageway. Good times. I wanted to make a quick plug here. With the price of gas being what it is, and the weather starting to get a bit warmer, Melissa and I have decided to try to ride our bikes as much as we can, and to save the car for longer trips. 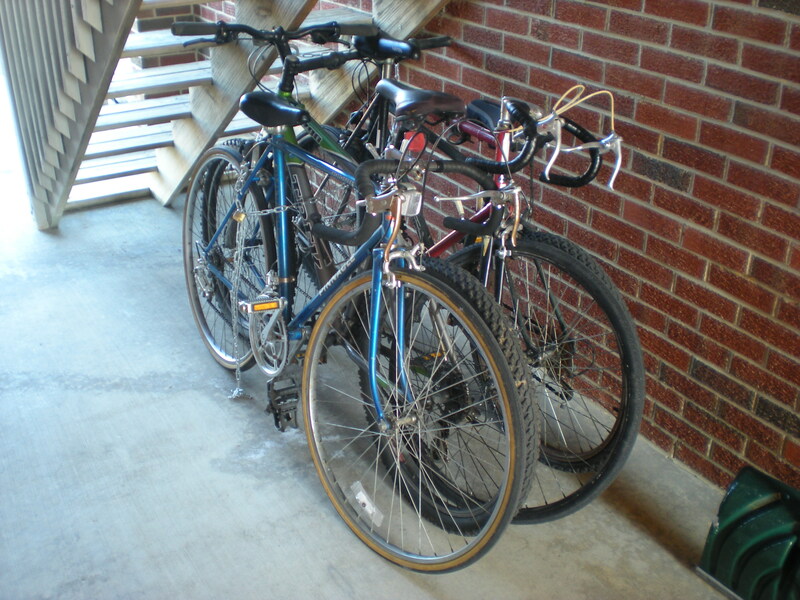 The issue has been that the bikes were in desperate need of some TLC. We got Ben Wyse to come and check them out. Ben owns his own bicycle mechanic buisness called Wyse Cycles. What makes his buisness unique is that he comes to you, riding his bike and towing all his tools in a little trailer. He set up shop in a sunny spot on the side of the road, put our bikes up on his stand, and got to work. And did an amazing job. Melissa’s ancient road bike is about three times the bike it was before, and my mountain bike as a whole new lease on life. He is fair, friendly, and fast, and it is obvious he loves what he does. If you’re in the area, and your bike needs some love, I’d encourage you to give him a call. He doesn’t have a website yet, but you can get in touch with him at (540) 383-4119. Melissa recently got a brand new harness, a pretty little Petzl Luna. Additionally, Jackie’s climbing shoes came in. We wanted to christen the new gear, so we planned a day of top roping to celebrate. 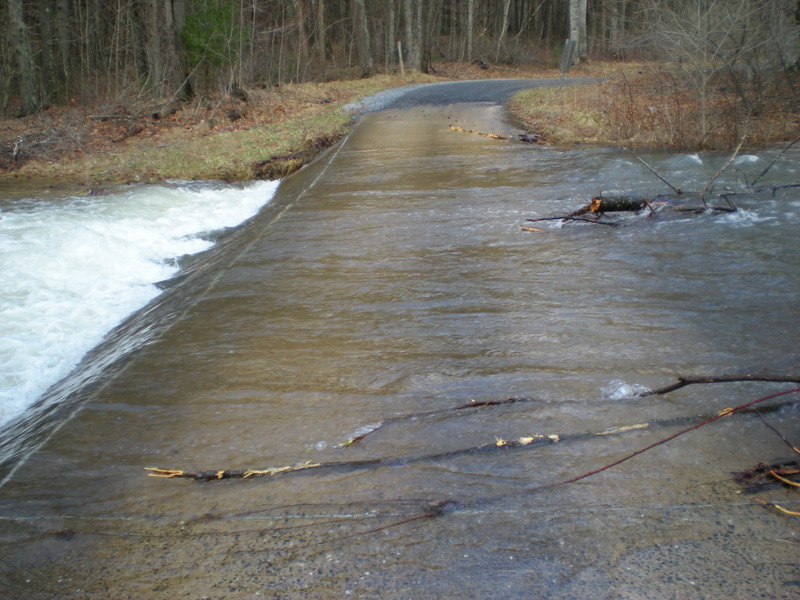 The water was rafting up pretty well on the upstream side of the bridge, and recirculating nicely at the front. We thought about crossing, but Josh and Jackie have a brand new truck, and we decided we didn’t want to risk sacrificing it to Poseidon. Discretion is the better part of valor, after all. So we hiked Lover’s Leap instead. We got a great view off the top, but could only stay a few minutes due to the weather. Cold and wet, with a sharp wind from the Southwest. We figured that it would be warmer, and didn’t bring gloves and hats for warmth (believe it or not, we are actually fairly experienced in the outdoors…but even us experienced folks make beginner’s mistakes sometimes!). 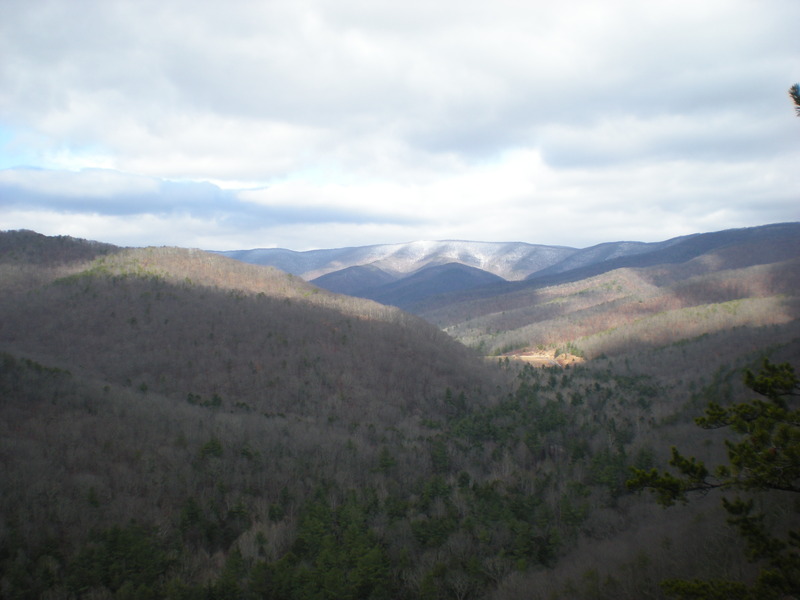 Here is a great shot of the view to the West; some snow up on the upper part of the ridge near Reddish Knob. All in all, a good day, though I have to admit I’m looking forward to consistent weather. I understand it’s March, but this “warm day, freezing day, rain day, freezing day, warm day” stuff is driving me crazy.